okey dah, siapkah kalian untuk melestarikan budaya ini. kita lihat 60 tahun lagi. Kalo gamelan masih eksis seperti saat ini, maka kita bisa dibilang berhasil. Gamelan comes from the word meaning gamel do, gamelan first made in the year 167, and is made of bamboo and the Javanese gamelan orchestra. Gamelan it contains many examples philosophy: It reads: nung ning nang nong neng. Nang (win), ning (Wening, thinking) nung (ndhunung, pray), neng (meneng, silent), nong (God). His name is: G (gusti), A (Allah), M (maringi), E (ants are-remember), L (lakonono), A (teaching), N (prophet). 1. 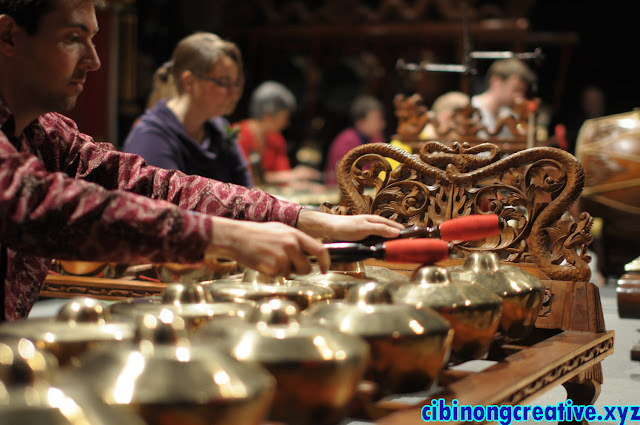 In play gamelan we must study the elements that support, such as rules, ethics, sense of togetherness and emotional sensitivity. 2.Do with a good attitude and sitting cross-legged. 3.In area should not be melangkai gamelan gamelan instruments. Ricikan shaped pencon mounted above rancakan with 2 rows of arrangement is called brunjung top and bottom is called dhempok. Consists of two smart. 1 smart for slendro containing 10/12 pencon and pelok barrel contains 14 pencon. Gong marks the beginning and ending gending and provide a sense of balance after the passing of sentences songs. Xylophone ada3 smart with blades that are made of wood, 1 reancak for slendro, 2 rancak to pelok, each consisting of 21 blades smart ranging from 5 to tone tone 5. Shape of the blades using a tube or bumbungan are made of bamboo. As a resonator. Gender barung contains 14 blades, gender successor to 14 blades. Drums played with the fingers and palms, kendhang which determines the rhythm and tempo, (keeping keajekan tempo, transition lead sooner or later, stop the rhythm of the gamelan). Kinds of drums. (No big drums, percussion puppet, kendshang ciblon, and ketipung). Example: Gender, xylophone, kemanak, kecer, saron, bonang, kenong, kempul, gong. Duty to control the rhythm of the dish, set the tempo and volume as well as stopping the piece. Instrument kendhang. Penetu duty and the guiding track, showing breath, spirit, and character of the piece is presented. Instrument Rebab, gender, bonang. Duty memjalankan existing song, as well as reinforce the melody. Instrument Gender, Saron, demung and howl. In charge of filling the songs. Gender successor instrument, flute, zither and sitter. okey dah, you are ready to preserve this culture. we saw 60 years. If gamelan still exist as it is today, then we could say successful.